I used Mark Bittman’s tart pastry recipe for the tart pictured; I’ve written the recipe, however, so that a matzoh crust can easily be substituted during Passover. Just couldn’t bring myself to brave matzoh…I’m not keeping Pesach this year, but I’ve done so enough to shy away from the stuff. Let’s revel in some chametz while we can – and get a little tart-making lesson. I always make pie and tart doughs in the food processor: this keeps your butter nice and cold, and thus prevents it from getting worked into the flour too much. Overworked dough equals tough crust. 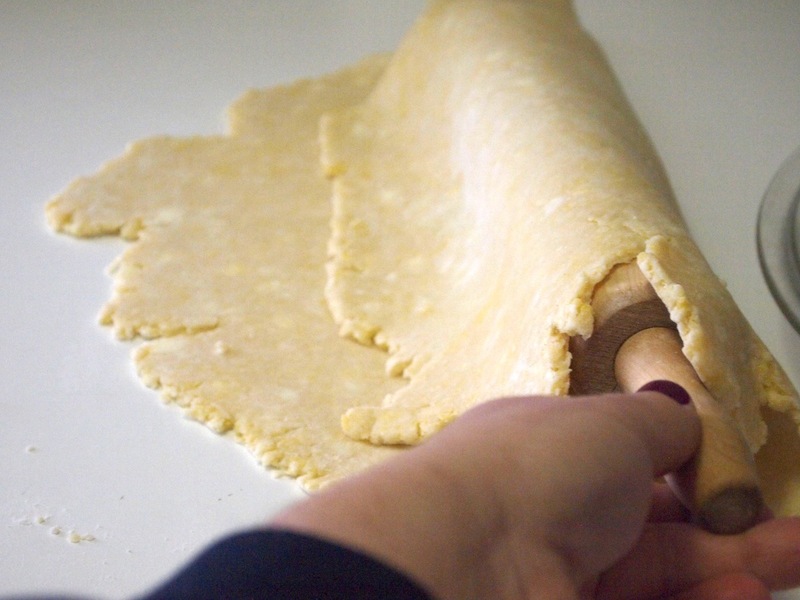 When dough is done and rolled out, I always find the best way to move it to the pan is to drape the middle of it over your rolling pin, and then lift it and sweep it into the pan in one smooth motion. Press the dough into the bottom of the pan, and cut off the edges hanging over the side. 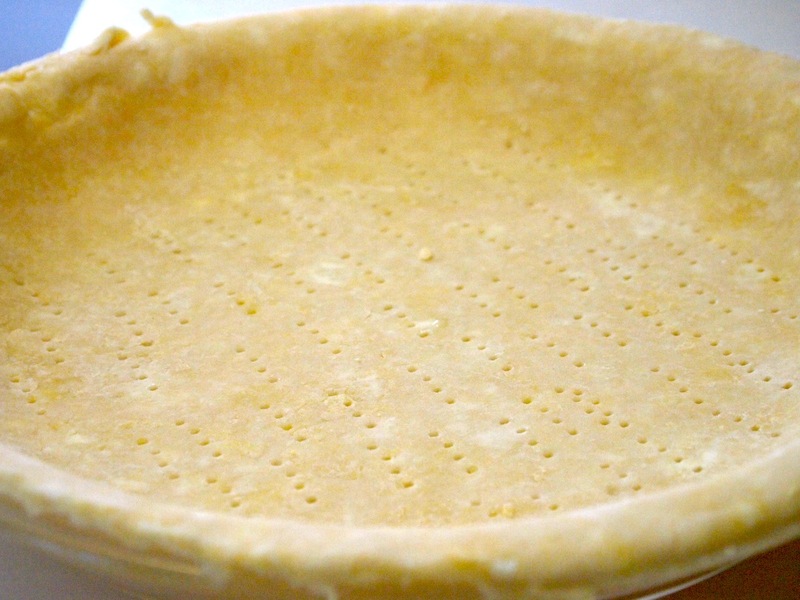 We’re making a tart, and are going to blind bake our crust so prick the bottom of it all over with a fork. 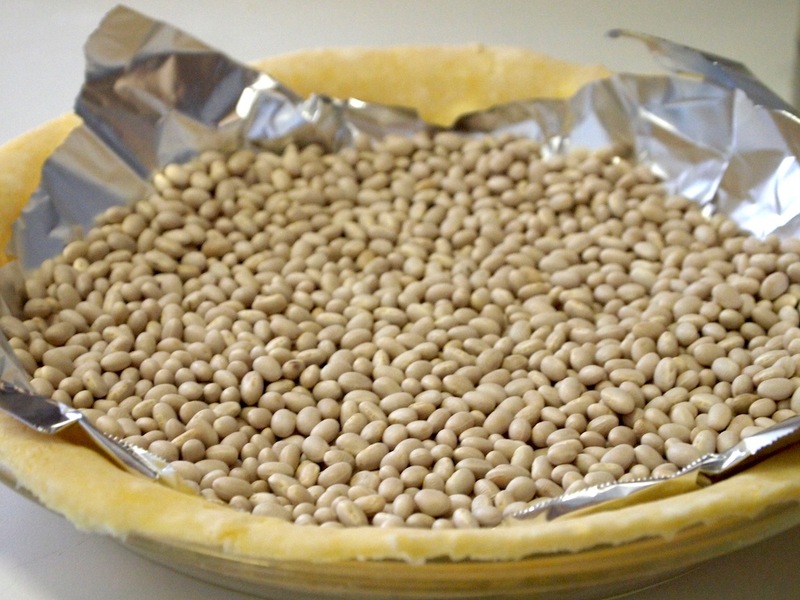 Weigh the crust down with pie weights (or beans) in foil. Now, pour in the frangipane and stick the apples in, curved side up. I tend to get pretty OCD about keeping mine in a pretty pattern. The apples get brushed with a little buttery wine reduction – use Manischewitz if you’re really getting into the swing of things. 1. Core the apples and slice them very thin (1/8-inch thickness or less). 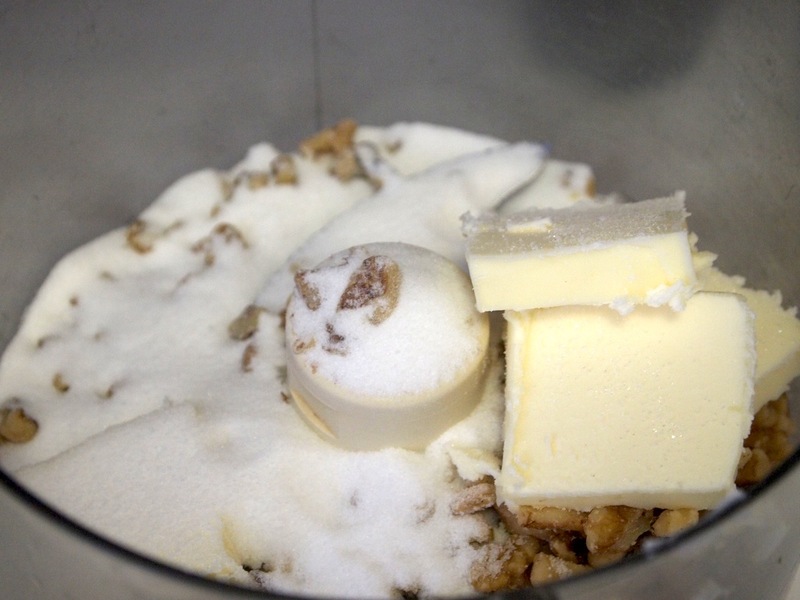 Place the walnuts, salt, sugar, egg, horseradish, and 4 tablespoons of the butter in a food processor and pulse until blended into a rough paste. 2. Prick your crust all over with a fork, cover it with aluminum and pie weights or dry beans, a blind bake it at 425 degrees – 15 minutes for pate sucree, 10 for matzoh. Remove the crust from the oven, gently lift the aluminum and weights off, and turn the oven down to 375 degrees. 3. Melt the remaining 2 tablespoons of butter and whisk in the wine, honey, and cinnamon over low heat. Remove from heat immediately when the ingredients have blended into a viscous glaze. 4. 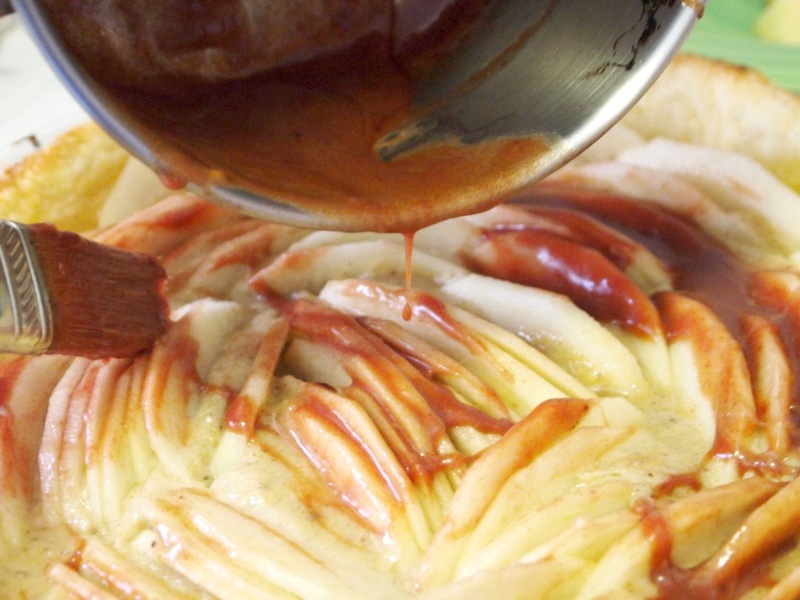 Pour the walnut paste into the par-baked tart shell and push apple slices, curved side up, into the paste. Press the slices as close together as possible without letting them touch. Brush the top of the tart with the wine glaze. 5. Bake for 30 to 40 minutes in the 375 degree oven, until the walnut frangipane bubbles up around the fruit. Cool to room temperature before serving. **To get rid of all the chametz…here’s a classic Matzoh Pie Crust (from the Complete American Jewish Cookbook): Soak 4 matzohs in water for 5 minutes, drain, and squeeze them dry. Heat 2 tablespoons vegetable oil or margarine, add the matzohs and heat until they dry out, then mix in a medium bowl with 1/2 cup matzoh meal, 4 eggs, 4 tablespoons sugar, and 1/2 teaspoon salt. Pat into the bottom of a pie or tart pan and blind bake for 10 minutes (as you would a graham cracker crust) before filling. For the filling, sub margarine for butter if you’re having a meat meal. Hi Celia! Just finished breakfast but I can totally eat a big pieace of this apple tart with my coffee as dessert. Have a good Sunday! So cool! I can’t even wrap my head around using horseradish in a dessert…I have faith in your recipes tho so I’m sure its a homerun. Well done! I am seriously intrigued. I love horseradish but would never to think to put it into something sweet. But why not? A surprising twist. This sounds and looks like heaven! And it’s so elegant! And I’d be all over that frangipane! This looks fabulous! I’ve never heard of horseradish in frangipane but it sounds sooo good. 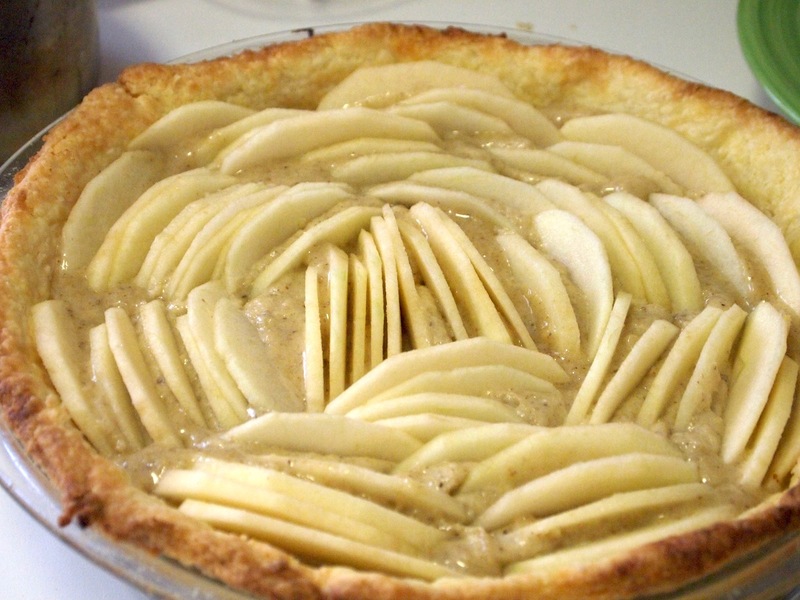 I like a little kick with my apple tart! The tart looks so pretty! I love the idea of horseradish in the frangipane – sounds great! mmm your tart look so good, and tasty! Delicious ingredients!!!Yummy! Good call on the regular tart crust, too. Despite tradition, I don’t know if I could ever bring myself to spoil such a pretty tart with a matzoh crust. Bletch. Woah, hold up. Horseradish? Dang. This is awesome. Looks beautiful, too. How gorgeous!!! 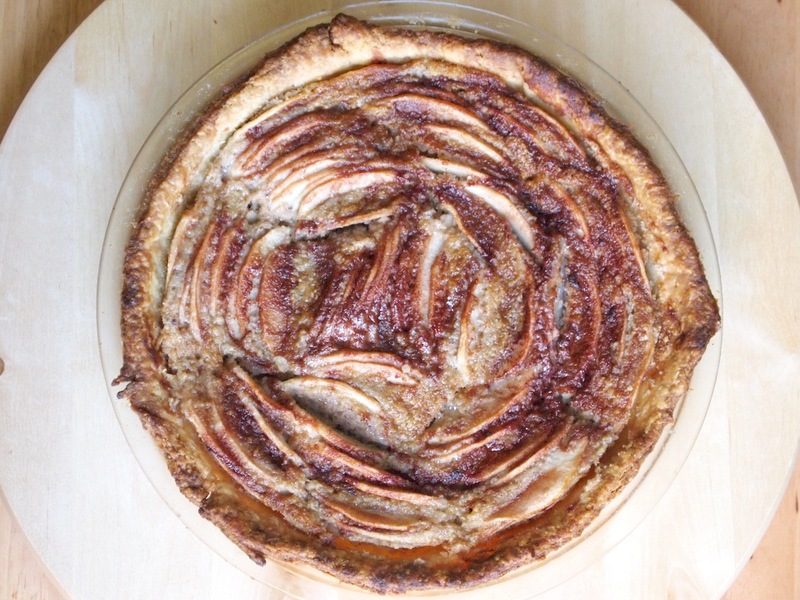 And what a fun twist on an apple tart! I’ve never had horseradish in a dessert before, sounds great! This would be great for the passover . Horseradish in a dessert is something I never thought of :p and I guess it must be great. Thanks for sharing this . Will try this out when I get hold of some horseradish. What an interesting combination, it look beautiful! That is beautiful! And horseradish?? Amazing.